"Had a superb time last night playing Halloween Lies. We've done several Freeform Games murder mysteries for my birthday and this year, hubby decided he'd like a freeform birthday too. We chose Halloween Lies because, being October, we figured costumes and decorations would be easy to find. We had such a fantastic response, we had to buy the expansion pack (although I have to say, as host this made planning envelopes etc much more complicated and some characters were worried that they didn't have as much info as others). The costumes were utterly amazing and, due to the unseasonable weather, much of the game was played in the garden! I have to be honest and say that folk were not that interested in making movies, but as always the format and fab writing enabled both newbies and old hands to get totally engrossed and people who had never met before were very soon in deep conversation. I love freeform MM's – they are the mainstay of some of the very best parties we have hosted over the years. Thank you." "We wanted ease of finding costumes (anybody can come up with a Halloween costume), plus a large party of 20+ people, plus Halloween Lies sounded more involved/interactive, less rigid structure than out of the box type murder mystery games. All the guests seemed to have enjoyed themselves – people thought the movies section was the funniest!" "I chose Halloween Lies Expanded because I have played Freeform Games before and LOVED them! All your games have been WONDERFUL! They play themselves for the most part!" "Halloween Lies is really such a fun game because of the delight people have when getting into Halloween costumes." 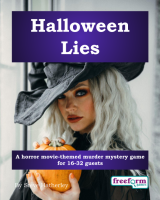 Halloween Lies is a dinner party murder mystery game for 16 to 32 guests and one or two hosts – download the free introductory pdf file. Join us in a thrilling evening of scheming, intrigue and skulduggery. You will be in the middle of the action and it will be up to you to wheel and deal with the other guests. Can you achieve your goals, keep your secrets hidden and survive Halloween Lies? It's up to you. Halloween Lies lasts for about four hours and is suited to an evening. It is often played over a meal – a finger buffet if possible to allow guests to circulate and talk in private. "Great game! Lots of fun! You have great customer service and I would recommend your site to anyone." Important note: Halloween Lies is an alternative version of one of our other games, Hollywood Lies. The characters and the plots are the same, so if your guests have previously played Hollywood Lies, they'll know the secrets of Halloween Lies too! The difference is that Halloween Lies is written specifically for a Halloween party, while Hollywood Lies is suitable for any time of year. Ash d'Lessey – Award-winning director of The Vampire Detective. Charlie Henderson-Plum – Played Skipper Primley, The Vampire Detective's British villain. CJ Vasquez – One of The Vampire Detective's co-producers. Claude Janvier – Composer who recently wrote the music for Ash d'Lessey's Blood Red. Evrim Meric – Bit-part actor with a minor role in The Vampire Detective. Ghana Moon – Award-winning screenwriter of The Vampire Detective..
Hayden Vicars – Co-producer of The Vampire Detective and Tom Speed's friend. Jackie Simpson – Actor fired from The Vampire Detective before filming started. Luca Delmonico – Comes from a very wealthy family and recently appeared in the movie The Sound of Screams. Morgan Beech – Star of blockbuster movie The Vampire Detective. Nat Rankin – Character actor who recently appeared in The Sound of Screams as a villain – as usual. Sam Cortinelli – One of The Vampire Detective's stunt doubles. Sam is rumored to have 'family' connections. Terry Ford – Character actor who played Hatch, a bodyguard, in The Vampire Detective. Val Taylor – Actor and producer, co-producer of The Vampire Detective..
Halloween Lies is unlike many murder mystery games. Although the game starts with a murder, most of the characters have more important things to do than to investigate it. And the killing may not be over – it is unlikely that everyone will survive the remainder of the evening! Halloween Lies is played just like a murder mystery game. You may be trying to solve the murder, but primarily you are (initially at least) concentrating on your own goals and objectives. Unlike most boxed murder mystery games, Halloween Lies lets you decide how to achieve your goals and thwart your enemies. "Halloween Lies was the BEST because all the characters had lots to do, were essential for the plot, intermingled and lots of subplots were happening at once." On the evening of the game the guests are met by the organizer, the Master (or Mistress) of Ceremonies. They then receive their detailed backgrounds - including dark secrets, objectives and money. The players can form alliances, blackmail each other, steal items and even try to make the best movie for next year. Along the way they may solve some of Halloween Lies's mysteries. What is the Post-Modern Freeform Movement up to? Who will get tickets to the charity ball? What really happened on the set of The Snow Beast? Which script will be made into a movie? And of course, how did Tom Speed die? Finally, the game concludes and everyone finds out how they did, and what secrets everyone else was concealing. Halloween Lies costs £30.00 (GB pounds) or US $49.99. You can buy it in either currency, from anywhere in the world, as you prefer. The price will be converted back into your own currency for you, at today's exchange rate. We offer a Cast Iron Guarantee on all our murder mystery games. If you're not completely satisfied with Halloween Lies then please let us know within 30 days and we will refund you. See our full terms and conditions here.